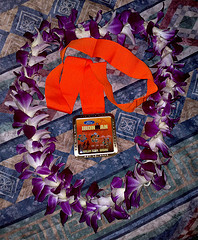 Time for the Kona race report. This could be a long one after all it was a long day. I figure if you’ve been following my blog in Kona you can cope though! Let’s start it all off be saying it was an amazing day for me. There have been times the past couple of weeks where I’ve been excited because I’m riding the Queen K or running Ali’i Drive. All those moments were rolled up into the race. On the one hand it’s hot, humid, windy and it hurts, but on the other I’m racing on the Queen K! I’m also really pleased with my result here and feel it really validates and builds on the work I’ve been putting in. I wouldn’t call it the perfect race by any means, but it was well executed and my pacing worked. Pacing is key! I’m lucky enough to be staying in a hotel literally across the road from transition. It does have its downside when they’re testing the PA system the night before the race. Race morning though it comes into its own. Slept reasonably well, waking on occasions, but nothing unusual. Typical mildly surreal race related dreams too, but unfortunately all forgotten now. Breakfast was a bagel, jam, cheese and chicken. Add a powerbar too and that was about it. Once that was in the system I had plenty of time for a relaxing shower and to start getting ready. I wandered over to body marking and transition when it opened. That was once again an example of the efficiency of the World Champs. So many volunteers meant minimal waiting. My number was on my arm in minutes and my bike was set up in a few more. All done so straight back to the hotel for a lie down. A real luxury being able to have 30 or 40 minutes of dozing to the sounds of the Ironman announcer outside. About 30 minutes before the pro start I headed back to transition with the lightest pre-swim bag ever. Again the hotel paid off as I realised I’d forgot to take my anti-diarrhoea tablets so had to go back. I debated how much they’re a placebo with Jo last night. Really couldn’t say, but they’re part of my prep at least! Still with plenty of time it was swimskin on. Tons of bodyglide to minimise chafing and then watch the navy demonstration and pro start. All that out the way and it was time to get into the water. I bumped into Roger on the beach and we headed out together. There’d been a fair amount of discussion amongst our group about where the best place to start the swim was. If you’re someone like Steven it’s up near the front, for the rest of us it’s less certain. ‘This seems as good a place as any’ were Roger’s fateful words. I happily agreed, but we would both be proved wrong very shortly. We opted for a few rows back, knowing with a stacked field we weren’t even second row material. The problem was we also opted to be over to the right hand side of the start. What neither of us knew was the surfers would be funnelling us over to the left of an orange buoy a bit further out. So when the cannon fired and the race started I set off and at first was unsurprised by the bashing I received. Once we started getting pushed over left things became really cramped. Each marker buoy was a nightmare to get through. Everyone crushed together and there was no clear water. You weren’t so much swimming as scrambling over people. Like my experience in Ironman Australia earlier this year I looked around me and couldn’t see any way to break free the crowding was too dense to all sides. It continued on near enough every buoy to the turn around. I can’t blame it entirely, but it certainly didn’t help me. 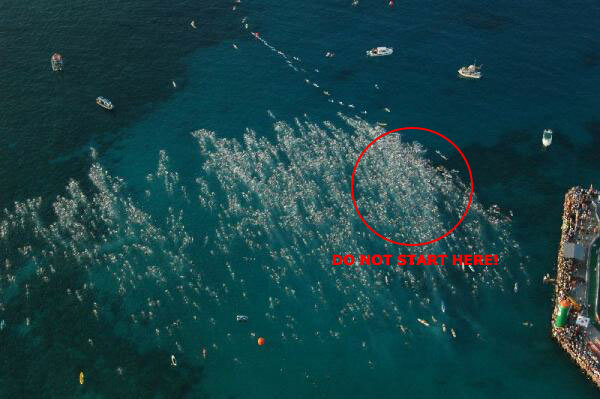 Hawaii has to be the roughest mass start swim I’ve done. Hitting the beach and seeing 1:09 on the clock I wasn’t entirely surprised. I think being prepared for that helped keep my head in order as I got ready for the bike. Transition involves quite a bit of running, but I got through it at an orderly pace and was soon mounting up. The bike course starts with a little out-and-back in town. It’s got a bit of climbing in, nothing too extreme. The main thing you’ll see is everyone hammers it! Look at the splits for bikes in the athlete tracker. I’d say pacing was a strength of mine, but even I went harder than I should! That said I didn’t go overboard and held back as people went past. Despite knowing my swim had me well back in the field a long day lay ahead of me. My legs ached, particularly below the knee, down the sides. I wondered if this related to how tight these regions are when massaged or given ART. Perhaps something to look at in the future – whether some focussed stretching could ease this. The first hour or so felt terrible though, I kept reminding myself I usually pick up as the race goes on. Easy to say, but I really wanted to see something happen. I kept pushing and kept focussed on keeping the heart rate where I wanted. I was also slowly reeling in more and more competitors so things weren’t that bad. I started to feel a bit better around the halfway mark. It took a while to come, but as I climbed up to Hawi my legs felt good. Come the turn around and the fast descent I knew now was when I’d see the results of sticking to my pacing strategy. Somewhere around this point I encounter Jo and also Nick Rose. I was pleased to see Jo was going well. Both asked me what I was doing back there! I have to apologise to Nick as I was a little snappy with him at that point. Turning back onto the Queen K it was straight into a relentless head wind. Whilst most people struggled for me the lights had come on and I just pushed. I ground out a big gear for the next couple of hours to bring it home. If you look at my splits I manage my highest average speed in these sections! Compared to many where the times start dropping off. I was pretty pleased with how the ride finished and pushed to try and get under 5:15. I missed by 21 seconds! But good enough and I was in T2 in under 6:30 so in theory the sub-10 was on. I didn’t overly rush T2, but without too much to do there it didn’t take too long either. One disadvantage with compression socks is removing the chip to put back on over them, especially when you’ve safety pinned them as advised! So maybe it could have been a little quicker. The first mile clicked by way too fast so I tried to settle into a more reasonable pace. After a couple more miles Roger caught up with me and we chatted and knocked off 7:15 minute miles for a while. I wasn’t feeling my best even though the pace was far from hard and eventually in one aid station I let Roger take a small lead. It soon grew and I wasn’t feeling up to closing it. He held back a little and kept checking for me which at that point just irritated me! Eventually realising I wasn’t going to be joining him he got on with things. I continued my low patch for about three miles then suddenly around the seven or eight mile mark I felt great again. I was excited to be racing here in Kona and couldn’t wait to experience the Queen K! I passed Steven walking an aid station and was a little shocked at how quickly I’d caught him. I’d seen him going the other way and he’d looked pretty good. He tells me this was shortly before he started getting his cramp issues and really suffering. I’m glad I didn’t catch him at that point. I’d also seen Jo on the run and the way she was going at that point I thought she’d catch me for sure. Up Palani and it wasn’t as bad as I’d feared! Then onto the Queen K. At first it was great, but soon the heat started to get to me. I wasn’t really that interested in my gels anymore, but forced a bit down every so often. I switched to using more Gatorade at aid stations. In fact taking on plenty of fluids and ice. Aid stations became less about nutrition and more about keeping cool. The energy lab seemed a long way to go. Though at least there was the boost of seeing the pros coming the other way. Some of them looked fantastic. Crowie was dominating over a tight male field. Chrissie was smiling as usual and near enough in a separate race to the other women. It was great to see Rachel well up there too. The Natural Energy Lab is as nasty as they say a hot descent followed by the climb back out again. The main thing driving me on was the knowledge it was the last real climbing I’d have to do. An American guy caught up with me near the top and we ran together from that point on. His goal was sub-10 like mine and we helped each other towards it. As the miles clicked over I’d work out the pace needed to break ten hours. It didn’t take long to ensure we’d make it. Perceived effort was way up, but funnily the result was basically the same splits I’d been seeing early in the race. The speed I’d seen elsewhere wasn’t coming. That said we were claiming plenty of places. It was a true war of attrition now, all about who slowed the least. We went through aid stations doing our best to take in a little bit of energy from Gatorade, but to keep cool. Attentiveness varied and one aid station saw me chuck Gatorade over my head drop a cup of ice, swear in front of the kids handing it out then swear in apology! There was no slowing though. I pushed hard up the ‘little’ rise to the top of Palani. Except it’s not so little once you’re on it and by the top I was gone. My running partner dropped me and I just pushed as hard as I could. Not as strong as I’d hoped, but enough to grab ten or more places in that last mile. A spectator yelled I should be smiling as I made the final approach up Ali’i Drive. I tried, but at that point I was working flat out to get the best time I could. There was the line. It was all over. Once final push and I was done in 9:47:30. My first time in Kona and comfortably under 10 hours! Leanda Cave finished just in front of me and clearly in a very bad way. We were helped through to the recovery area where I caught up with Roger. Turns out I’d held the gap at about a minute the whole of the race! We were both pretty pleased overall though Roger hadn’t quite made the podium like he’d hoped. Still good days all round. Plenty of pizza and ice cream was then consumed. A quick chat with Bevan and John which turned into an interview for the IM Talk podcast, go check it out. Then I quickly checked out the bike and took advantage of the closeness of my hotel to go get a real shower before heading to Splashers for an obscenely large burger and lots of fluids. Yes I tried Volcano ice cream and yes it was as good as Steven had promised. I spent the evening alternating between eating and drinking and feeling sick with how full I was! The plus side was I was fully hydrated by the time I got home and felt pretty good for it. Getting that well rehydrated does a lot to speed up recovery for sure. Before I got back to the hotel we watched the last finishers home and the fire dancers and closing song. It was a great finish to a great day.